There was no way on earth that I was going to allow him to be called Jock. No way! The nice people at the Cat Protection shelter might know all about giving a cat a decent home, but they knew zilch about giving him a decent name. No self-respecting bloke would ever call his moggies Jock or Nigel, but when the little fellas first arrived, those were the names on the docket. Not for long though. Those names weren’t going to survive the day! There’s something pretty important about choosing the right name for your cat. While some people put all their energies into coming up with ever more exotic names for their children, a bloke likes to get the name of his pet just so! Call your kids by sensible names like Dave or Brian or Steve. If you give them names like Lennon or Prudence or Alban or Columba, they’ll grow up to hate you, but give your cat the right name and it can say more about you than designer labels or brand name accessories ever can! After all, for a bloke it’s an indication of your lifestyle choice, and for me, I was at that strange stage in the development of my laddishness when I had become fascinated by Soviet memorabilia and Russian constructivist design (it’s a phase every lad goes through, isn’t it?). Conveniently, this obsession also tied in quite nicely with a period of my life when I would find myself washing up in former outposts of the Soviet empire, places like Poland, Bulgaria, Estonia and Albania. Ostensibly I would be there for the football, but in the run up to the big match you couldn’t ever turn your nose up at the opportunity to frequent the many and varied fleamarkets of those former Soviet republics and their pre-Glasnost satellite states. Whether it was a large embroidered marching flag of the Latvian Musical Instrument Makers Union, featuring the profile of Lenin on one side, or a six-inch-high die-cast statuette of Stalin, there were bargains to be had. And this fanciful obsession with icons of the Cold War was obviously the best starting point when I came to choosing a name for my cats. Obviously. There were other suggestions, of course. Lennon and McCartney were in the frame, and then with a subtle East-meets-West, left-meets-right, political twist, Lenin and McCarthy were under serious consideration (did you see what I did there?). 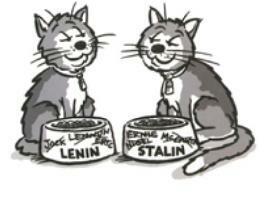 In a slightly retro celebration of my post-baby boom British pop culture, I also toyed with the idea of Eric and Ernie for a while, but when putsch came the shove, it was really always going to be Lenin and Stalin! But there was a problem. The Evil Woman Who Hates Cats wasn’t happy. Her mother had once frozen in horror ten yards from the front door and had refused to come into the house after the merest glimpse of a ‘Vote Labour’ poster in the window, and there was a serious worry that a cat called Stalin might just push her over the edge. I thought about it for a short time, but while you can always get yourself another mother-in-law, a good cat is hard to come by, and my new furry comrades were shyly introduced to the house. It took them a while to settle in (I’ll tell you all about that next month), but soon they were already earning their keep and Stalin was successfully living up to his name. As I’ve confided on these pages before, the main reason that Stalin became a household necessity was the determination of The Evil Woman Who Hates Cats to stamp out the unwanted invasion of mice. And for that reason alone, he’s been a tremendous acquisition. Aside from the love and affection that the little fella brings to the house, the ruthlessness with which he patrols the borders of his domain means that there isn’t another live animal left within a 20 yard radius. Mice, birds, voles, rats, small dogs even, are all culled with a Stalinist efficiency that would certainly impress his namesake. Trouble is, we made the mistake of immediately showing the little fellas to our neighbour, Sue Nextdoor, on the day they arrived, and now, some three years later, despite the regularity with which I holler the name ‘Stalin’ down the back passage, she still pops by from time to time to ask after little ‘Jock’. I haven’t the heart to tell her that I have absolutely no idea who she’s talking about sometimes! But as for Stalin, well he knows what his name is – and he loves it!